Album is a beautifully crafted theme perfect for bands, musicians, music venues, record labels, or anyone who wants to showcase and promote the music they love. Album features a custom MP3 audio player which is persistent — it doesn’t skip a beat when browsing different pages — creating a seamless experience for your visitors. Easily manage your music, albums, blog, gigs, and shows with the power of the Album theme. On the homepage, Album offers a large featured-album area. Showcase your artwork and let visitors easily select tracks and play music. The custom MP3 player at the top of Album gives you the power of sites like SoundCloud and Bandcamp, but with the ability to choose which album and music to feature. Whenever you navigate to a new page, the music will pick up wherever you left off — without needing to restart the track. Feature more albums and music on the album page and when you’re ready to shine the spotlight on a new album on the homepage, simply select it in the Customizer. Uploading MP3s requires the Premium or Business upgrade. Have a few upcoming gigs? Add them to your homepage and your “Shows” page with as much info as you’d like. 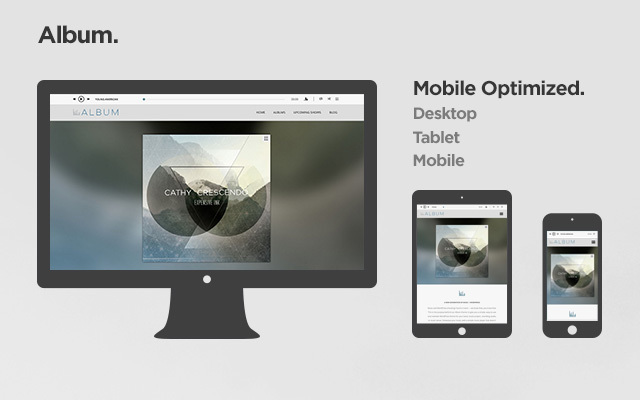 Album features a fully mobile-friendly design — so your music is accessible on computers, tablets, and mobile devices. Plus, your photos, videos, and text will display beautifully no matter which device your visitors use to reach your site. You can customize Album easily through the Customizer. Select a featured album and post for the homepage, choose a category of posts to display as your “Shows,” and select social media icons to appear in the footer. Album supports Custom Backgrounds, and you can add your own logo or custom header image. Further options like Custom CSS, font changes, and more custom color options are available through Custom Design. Album offers widget areas in a right sidebar – visible on the blog and two-column pages – and in a three-column footer. The main column width is 770. The sidebar width is 400. The footer widget area widths are 400. Featured Images are 1280 by 676 as header images on single posts and pages.